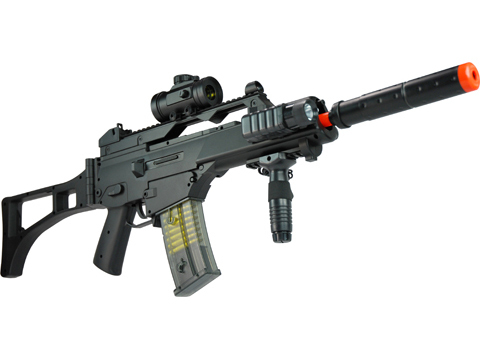 Introducing the G36C AEG Electric M85 Assault Rifle Airsoft Gun. This Electric Airsoft Rifle has a plastic construction design making it light weight and easy to carry for all ages. Able to fire in both semi and full automatic firing modes you can pick and choose your shots wisely or go in guns blazing. This awesome AEG features an integrated rail system which will allow you to add on all of your favorite accessories like the included fore grip, flashlight and red dot scope, making this AEG an awesome tactical rifle! With a side folding rear stock you will be able to customize the rear stock to fit you perfectly for better accuracy and precision. Even with fire power of 200 FPS you don't need to worry about running out of ammo anytime soon thanks to the 40 round magazine that is included. This awesome AEG also comes with everything you need to get started including a 7.2V rechargeable battery and a wall charger!So hurry up and get the G36C AEG Electric M85 Assault Rifle Airsoft Gun, the ultimate weapon to take into battle!